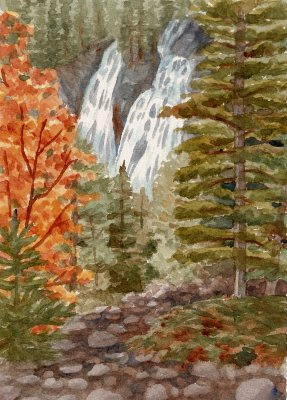 There is nothing quite like the majestic roar of a waterfall as it cascades over rocks. This spectacular waterfall is double the beauty. The river above, Twin Falls Creek, is cut in two by a wedge of rock before tumbling over a great limestone cliff to a narrow gorge below. You will have to travel to the Yoho National Park in British Coumbia to see this sight, but if you only see one waterfall in the Canadian Rockies, make it this one!